Infrared sauna therapy has been shown to significantly decrease pain and other symptoms of fibromyalgia syndrome. Infrared sauna therapy is also used to help treat blood pressure, depression, diabetes, allergies and congestive heart failure. The natural health world is buzzing about the growing body of evidence confirming the amazing benefits of infrared sauna therapy. The heat from infrared saunas is powerful and deep, yet surprisingly gentle and easy to tolerate at the same time. Studies show that, in addition to deeply heating your tissues and inducing an intense sweat to help detoxify, infrared sauna therapy causes other health-promoting changes in the body that ultimately lead to profound improvements in chronic pain. Infrared sauna therapy has been shown to significantly decrease pain and other symptoms of fibromyalgia syndrome, a chronic disorder that is characterized by widespread pain with localized tenderness. Researchers from Kagoshima University Hospital, Japan, studied the effects of infrared sauna sessions in 13 female fibromyalgia patients. Patients received infrared sauna therapy in cabins heated to 60°F (140°F) once per day for 15 minutes, two or five days a week. After the sauna sessions, the patients went into a warm room and were covered with a blanket from the neck down to keep them warm for 30 minutes. All patients’ pain was significantly reduced by about half after the first session and the effect became lasting after about ten treatments. At that time, pain was decreased by 20% to 78%. In another study in 44 female fibromyalgia patients, three months of sauna therapy three times a week, along with underwater exercise twice a week, decreased pain and other symptoms by 33% to 77%. And the improvements lasted: pain was still 28% to 68% improved six months after the end of the study. Infrared sauna sessions significantly reduce pain and increase walking distance in people with peripheral arterial disease (PAD), a common form of cardiovascular disease in which plaque builds up in the arteries that carry blood to the limbs. PAD results in reduced blood flow and oxygen to the lower legs and feet and results in leg pain, especially while walking. Japanese researchers from the School of Medicine at Kagoshima University studied the effects of infrared sauna therapy in 21 patients with PAD. Patients were randomly divided into a control group and a study group. Both received standard drug therapy, but the treatment group patients also had daily 15-minute sauna sessions in a 60°C (140°F) infrared sauna. After the treatment, they were covered in a blanket to rest and stay warm for 30 minutes. After six weeks, patients in the infrared sauna group experienced an almost 70% reduction in pain, compared to no pain reduction in the control group. On a scale of 1 to 10, pain scores decreased from an average of 8.1 to 2.8 in the sauna group, but remained unchanged in the control group. Exercise performance also significantly improved for those in the sauna group. In a six-minute walking test, they were able to walk almost twice as far without pain after the six weeks of infrared sauna use, while those in the control group experienced no change in walking distance. Researchers are just beginning to study the effects of infrared sauna therapy on pain and stiffness caused by different autoimmune diseases, such as rheumatoid arthritis and ankylosing spondylitis. In a preliminary, 4-week study, 17 patients with rheumatoid arthritis and another 17 patients with ankylosing spondylitis underwent twice-weekly infrared sauna sessions for 30 minutes at 55°C (131°F). While in the sauna, all participants enjoyed statistically significant temporary reductions in pain and stiffness. At the end of the study, those with rheumatoid arthritis showed improvements in pain, stiffness, and fatigue, although the improvements did not reach statistical significance. Perhaps more frequent sauna sessions for a longer overall time period would have resulted in longer-lasting pain relief. What about chronic pain related to other conditions? Infrared sauna sessions appear to improve pain caused by just about any source. In one study, investigators studied 46 patients with chronic pain of at least 6-month duration. The patients were divided into two groups, one group that received cognitive behavioral therapy, rehabilitation, and exercise therapy without additional sauna therapy, and another group that received the same treatments but also had 15 minutes of 60°C (140°F) infrared sauna therapy five days weekly for four weeks. At the end of the treatment, patients in both groups had significantly less pain, but those in the sauna group exhibited diminished pain behaviors and had statistically lower anger scores compared to those in the non-sauna group. When researchers followed up after two years, 77% of the sauna group had been able to return to work, compared to only 50% of the non-sauna group. With all this new research suggesting significant pain reduction, it is no wonder infrared saunas are being installed in doctor’s offices, spas, wellness centers, and private homes around the world at an increasing rate. If you have any kind of chronic pain, infrared sauna therapy could work for you as an excellent, all-natural, non-drug pain treatment, and it’s well worth checking on the availability of an infrared sauna near you. At this point, it’s not clear what the optimal infrared sauna temperature, duration, and frequency is to lessen pain, but the Japanese method appears most effective. The Japanese recommend shorter, more frequent sauna sessions. Daily or almost-daily 15-minutes sessions are always followed by a 30-minute warming period during which time you lie wrapped in a blanket. Patients are given lots of fluids to replace those lost, so make sure you’re drinking plenty of pure, filtered water during and after your sessions. For more information on infrared saunas and their benefits, including tips on how to find a provider, please continue to read part 1 article. Complement Ther Clin Pract. 2011 Aug;17(3):162-6.
arthritis, cardiovascular, cardiovascular disease, chronic pain, cognitive behavioral therapy, detoxify, exercise, fibromyalgia, fibromyalgia pain, health, infrared sauna therapy, leg pain, natural health, pain, pain reduction, pain relief, pain treatment, rheumatoid, rheumatoid arthritis, studies show, symptoms of fibromyalgia. Thank you for the article however you did not specify whether the studies’ results were from utilizing near-infrared or far-infrared saunas. Thank you for your article, it’s realy nice. 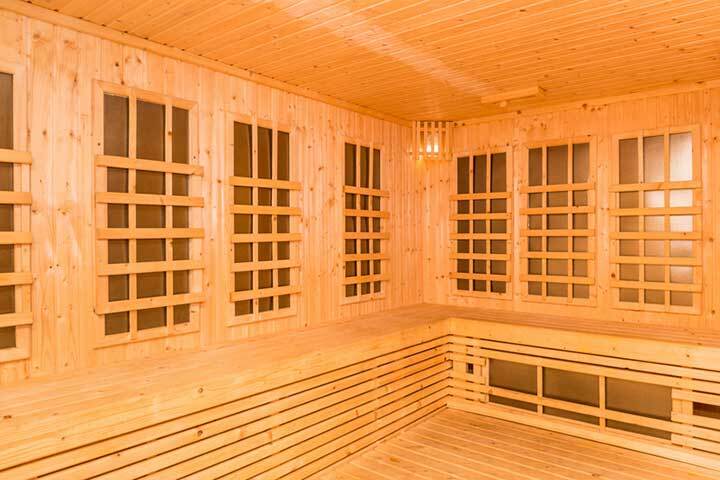 But finaly we choosing between two different saunas for our big family and finally stopped 4-Person Corner Golden Infrared Sauna from InfraredSaunaGuru for two specific reasons: first of all it came cheaper than from the other distributor, and secondly – it is better than we expected. A must have in any home – that is what we think!